Between 1st September to 30th November we have access to the Alexander Street Press video database. This offers access to streaming video across a wide variety of subjects and disciplines. Users can create playlists of whole videos, film clips, and Web content that can be saved and shared. Video from Alexander Street Press databases can be viewed alongside synchronized transcripts and can be downloaded to Apple or Android phone (good for 48 hours). The Video Journal of Counseling and Psychotherapy. Feedback: Please email library@rhul.ac.uk with any feedback that you have on the database. This January the Library Loves Resources – and we’ve updated our Pinterest board with some facts and figures to celebrate. In the Autumn Term, we’ve bought over 100 student requests. Don’t forget, you can request a book for your course or assignment using the More Books form. Look out for more updates on The Library in Numbers! 2013 Exam Papers Are Go! 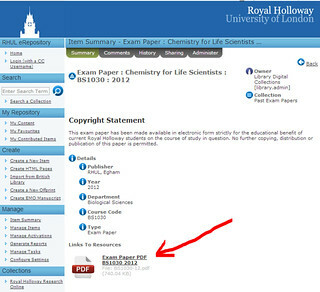 Exam papers for courses run in 2012-13 are now available! The Exam Papers are held in Royal Holloway’s Institutional Repository, which holds all sorts of things from PhD theses to academic research and work. To view the available exam papers click on “Past Exam Papers” (second from the top of the listed collections). Exam papers are divided by subject area and most of these will be displayed on this first page. Clicking on the relevant department with link you through to the exam papers for that subject. 1) To view exams for each department by year, click on “Department/Year”. 2) To see a list of all the courses for each department, click on “Department/Course Code”. When clicking on the desired year or course code, you will find that this takes you through to a page listing the Exam Papers as PDF files. From this click on the exam paper you want to see and this record will contain the PDF file, which you will be able to click on and download. BL 19th Century: Over 65, 000 recently digitised first editions from the British Library’s 19th century collection, comprising over 25 million pages of previously rare and inaccessible titles. ECCO: Eighteenth Century Collections Online (ECCO) is a digital collection of more than 180,000 titles published in Great Britain and its colonies during the eighteenth century. EEBO: Early English Books Online (EEBO) contains the scanned images, and plain text digital versions where available, of over 125,000 books published in English up to 1700. Content from all three collections can be searched at once, or individual collections can be selected and browsed. – Under E-resources on the English and Drama & Theatre subject guides. 1. Go to The Databases A-Z guide on the library subject guides. And the website has its own Quick Reference Guide. ScienceDirect is one of our major databases. It contains thousands of Full text journal articles. Beyond its core collection of Science and Life Science titles, ScienceDirect also includes many Economic and Social Sciences and a few Arts and Humanities titles. Most subscriptions to titles go back to at least 1995 but in many cases we have purchased backfiles which take us back further. Important Note: We don’t subscribe to every journal contained in ScienceDirect. If you find something we don’t subscribe to follow these steps to finding journal articles. There are several help videos available on the ScienceDirect help pages. You can either use the Quick Search bar located on the top of every page with a navigation bar, or use the Advanced search button for a more enhanced search. 2. Click or press Enter to begin your search and display your article search results. 1. From the ScienceDirect homepage, click the Search button on the navigation bar. The search page will open. Note: The available Advanced Search fields vary depending on the type of content you are searching. 5. Search a specific publication type. Example: Use the Advanced Journals search form to search only journals or only books. 7. Click or press Enter to begin your search and display your article search results. Note: You can further refine, edit, and save your search, in addition to setting up search alerts from your results page. 3. Select “Login via UK Federation”. 4. Type Royal Holloway into the search box and click “continue”. 5. You will be taken to an Athens login authentication point. Do not use the Athens login box, but instead click on “Alternative login”, to the bottom left of the box. 6. 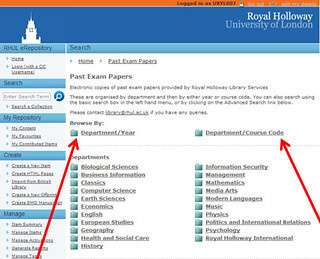 In the quick search box type in Royal Holloway, click on “Go” and Royal Holloway should appear at the top of the list. 7. Click on this link, which will take you to a page which allows you to “Go to the Royal Holloway, University of London login page”. 8. You should first tick the “Remember this organisation on your computer” box, then follow the “Go to the Royal Holloway, University of London login page” link. 10. New users will be offered a Registration Form to complete. 11. Read through the terms and conditions of ESDS, and click the button to indicate that you accept them. 12. Once you have accepted the terms of ESDS you will be sent an e-mail asking you to confirm your intention to register. Click on the link in the e-mail and your registration will be complete. You will now be able to use ESDS services.